Israel was linked to the interception of the missing cargo ship Arctic Sea last month, a senior figure close to Israeli intelligence has told the BBC. The source said Israel had told Moscow it knew the ship was secretly carrying a Russian air defence system for Iran. Russian Foreign Minister Sergei Lavrov has dismissed speculation that S-300 missiles were on board the ship. Israeli Prime Minister Benjamin Netanyahu, meanwhile, has denied making a secret visit to Moscow on Monday. Mr Netanyahu's office says he was visiting an Israeli security installation when he vanished from public view for much of the day. 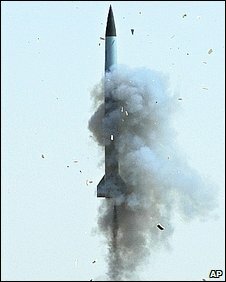 A BBC correspondent points out that the claim of a secret arms shipment come as Israel seeks to highlight the threat posed by Iran. Tehran faces a deadline to open talks on its nuclear programme or face possible sanctions from the UN. 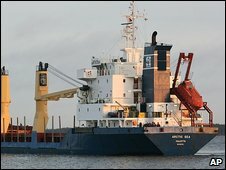 The Maltese-flagged Arctic Sea and its 15 Russian crew vanished in July days after leaving Finland with an apparent cargo of timber destined for Algeria. It was found on 16 August off West Africa. Moscow announced that the Russian navy had captured the hijackers and rescued the crew. Eight men were later charged with hijacking and piracy. However, the Israeli source told the BBC that the piracy story was a cover and that Israel told Moscow it was giving officials time to stop the shipment before making the matter public. On Tuesday, Mr Lavrov called media speculation that S-300 missiles were on board the Arctic Sea "groundless". He also promised a "transparent" investigation into the disappearance of the ship. Israeli media are linking the Arctic Sea incident to reports in the Hebrew language daily Yediot Aharonot of a clandestine visit by Mr Netanyahu to Moscow on Monday. The prime minister's office insisted that he had been visiting a "security installation inside Israel". The Kremlin press service said "nothing is known" about the reports, AP news agency reported. Dmitry Peskov, a spokesman for Prime Minister Vladimir Putin, added that he had no information about any visit by Mr Netanyahu, Russia's Interfax news agency said.